It's well known that servicing your Ford regularly will go some way to avoiding mechanical issues, keeps them running well and ensures a high resale value.But why go to a main dealer to get Ford servicing in Bradford when you can get the same quality for much less? At Drive in Service Centre in Shipley we’re real Ford specialists, and we want you to stop paying the high prices charged by main dealers when we can provide the same level of service, repairs and high quality parts at a fraction of the cost. Just like a Ford main dealer, but without the big prices! Our prices are low. That’s because unlike main dealers, we don’t have to inflate our prices to cover enormous overheads. Comparatively, overheads are small, so our prices can be a fraction of the price of a main dealer – sometimes 60% less! Best of all, you’ll save yourself a pocket full of cash! A government ruling known as ‘Block Exemption’ allows you to pick a garage of your choice when it’s time to service your Ford without invalidating any manufacturer’s warranty. 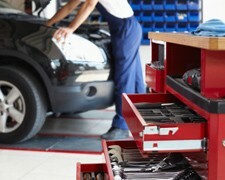 So when your Ford needs servicing or repairs, come to us. We think there’s nowhere better in Bradford or Shipley to have your servicing done and, once you’ve found out about our prices, we think you’ll agree. Don’t delay, pick up the phone and call us on Bradford 01274 794991.